This beautiful hollow ground traditional skinning knife, with a thick 4 1/4" high carbon stainless blade, combines the best of old and new. Used to be that knives came with an edge so crudely beveled that it was a mark of pride among the old whittlers on my home town's square that they had spent the many careful hours of whetting required to actually shape the edge well enough to actually cut. Hollow grinding makes that level of edge available to even those of us who don't have much time to spare. I can appreciate a good machinist's blade but that is an entirely different approach than Buck's, the company that still pursues the high end of the smith's art. This fixed blade knife is short enough for good leverage and power, features important to a skinning knife as well as a general purpose utility model. The handle with its rich ebony wood-grain look is hand friendly, so if you undertake a project that requires more than a few minutes you won't blister the skin off your hands. 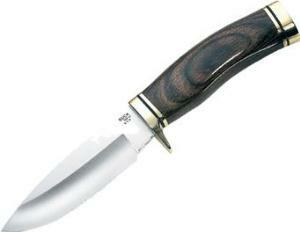 It's an outdoorsman's knife, but only because wearing a sheath knife to work is not socially acceptable today. Despite the many folding versions of hunting and skinning knives available, the fixed blade sheath knife is still the best choice for field use. That's not just because it is simple and won't fail; the old styles are naturally more sanitary and easily cleaned. You may not think that's an issue until you spend a few days in the bush with intestinal troubles. After that, a folding skinner may not look so pretty. Buck puts its lifetime warranty up front where you can see it; it's a name to trust.